The gospel is that God himself has come to rescue and renew creation in and through the work of Jesus Christ on our behalf. Why does creation (including me) need rescuing? Because of sin . Sin is living for my fame an d glory in stead of God’s. Sin is living life my way, for me, in stead of living life, God’s way, for God. We h ave all sin n ed an d really need the gospel—we desperately need Jesus to rescue us from the penalty and affects of sin, which the Bible teaches is ultimate an d eternal separation from God. When we repent (change our mind about who is really God in our lives) an d by faith we believe that Jesus’ life, death an d resurrection has secured our rescue an d restored us to a right relationship with God the Father, then this good news is true for u s! And we have been sent out to proclaim this same gospel of restoration to the entire world. We can read the Bible across the grain (thematically) and we can read it with the grain (as a story). Both are necessary and each one leads to a different way of seeing the gospel. 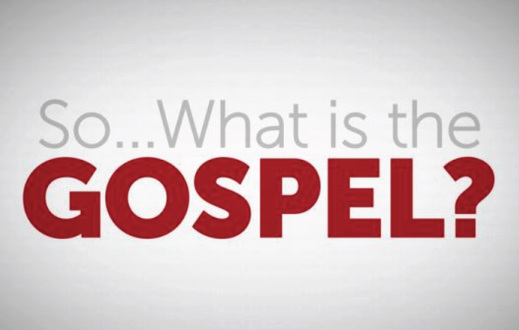 It takes both perspectives to fully understand and e gage the gospel. The Gospel Power. We understand the means of salvation . God — eternal, all powerful, creator of everything. Sin — humanity has all chosen self rule over submission, in relationship, to God; the penalty for sin is death. Jesus — God incarnate came to die as a substitute for the penalty of humanity’s sins. of sin . This means the same power that saved u s from the penalty for sin also helps us obey God now. (Ephesians 2:8-9; Colossians 1:27-29; 2:6-7). I am more broken and sinful than I ever dared believe, and at the same time I am more loved and accepted than I ever dared hope, because of Jesus. How does this happen? Jesus helped clarify how we accomplish the purpose of the gospel by giving u s h is mission : “Go and make disciples”. (Matthew 28:19). As the arts, industry, politics, families—all areas of culture — are being filled with Jesus’ disciples bringing about h is gospel restoration , the earth is being filled with his glory! That is the point of the restoration of all things — that God would be glorified! The gospel is not just about my individual happiness or God’s plan for my life. It is about God’s plan for the world. Therefore, if anyone is in Christ, he is a new creation ; the old h as gone, the new has come! All this is from God, who reconciled us to himself through Christ and gave us the ministry of reconciliation: that God was reconciling the world to himself in Christ, not counting men's sins against them. And he has committed to us the message of reconciliation.